Sunday was the day. The day of all days when SuperTour Finals in Presque Isles, Maine witnessed the fastest 4 x 5-kilometer mixed relay team in the land. Over the last four years of the mixed relay competition at the U.S. 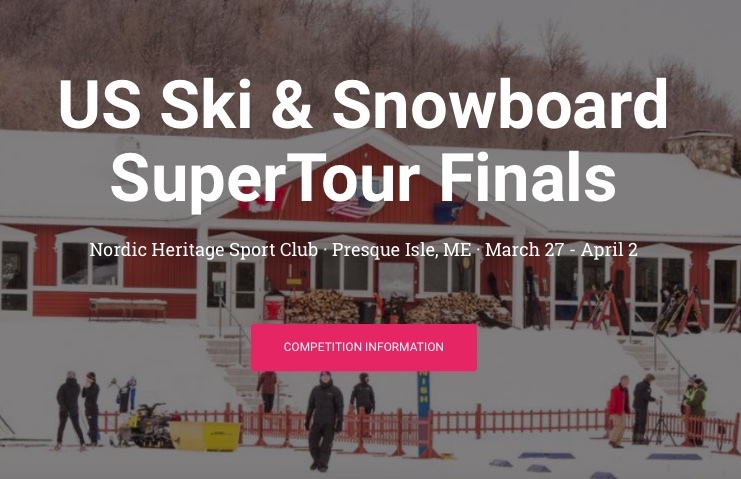 Ski and Snowboard SuperTour Finals, also known as Spring Series, Alaska Pacific University APU won the first two iterations of the event, SMS T2 the two most recent. The foursome comprising APU 1: Rosie Brennan, Erik Bjornsen, Sadie Bjornsen, and David Norris set the record straight. They claimed the mixed relay crown on Sunday in 59:27.7 minutes. Each athlete skied twice around a 2.5 k loop with the first two legs classic technique, the last two skate. SMS T2’s first skier, Sophie Caldwell, tagged off to teammate Kyle Bratrud in first with a slim 1.7 second lead on APU 2, and a two second lead on “Cedar Leaves” of the Craftsbury Green Racing Project. APU 1 tagged off in fourth place 7.9 seconds back. These four teams remained the podium challengers of the 13 official teams entered. By the second tag, with the classic legs finished, first through fourth places did not deviate from APU 1 in first, SMS T2 in second, APU 2 in third, and “Cedar Leaves” in fourth. SMS T2 took second overall in 1:00:27.0 hours. Along with Caldwell and Bratrud, Julia Kern and Simi Hamilton raced the third and fourth legs respectively for SMS T2. APU 2’s Hailey Swirbul, Scott Patterson, Rosie Frankowski, and Logan Hanneman placed third in 1:01:14.1. Ida Sargent, Ben Lustgarten, Caitlin Patterson, and Akeo Maifeld-Carucci of “Cedar Leaves” placed fourth in 1:01:31.1. Racing continues on Tuesday with the women’s mass start 30 k skate and the men’s mass start 50 k skate.